Watlow® duct heaters are constructed of sturdy 0.430 in. (11 mm) diameter WATROD™ heating elements mounted to a 1⁄4 in. (6 mm) thick steel flange. 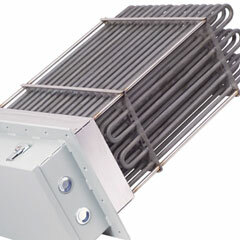 These air duct heaters are easily adapted to many non-pressurized air-heating systems. Duct heaters are easily installed in applications requiring a wide range of temperature versus air flow combinations. The modular duct heater offers increased reliability. The individual modules are removable through the housing of the assembly, which eliminates the need to pull the complete heater from the ductwork. This reduces downtime costs because the heating elements can be replaced individually. Performance improvements include quicker response time and reduced infiltration from the air stream being heated into the electrical enclosure. Duct heaters with general purpose enclosures meet UL® and CSA component recognition to 480 and 600VAC maximum respectively—UL® and CSA file numbers are E52951 and 31388.